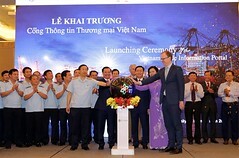 A ceremony was held in Hanoi on July 12 to officially launch the Vietnam trade information portal (VTIP) at http://www.vietnamtradeportal.gov.vn. The event was attended by Deputy Prime Minister Vuong Dinh Hue, Minister of Finance Dinh Tien Dung, and Acting Country Director of the World Bank in Vietnam Sebastian Eckardt. The portal, hosted by the General Department of Customs under the Ministry of Finance with technical support from the World Bank Group in Vietnam, is expected to help improve the predictability and transparency of, and access to, Vietnam’s trade rules and procedures. Addressing the launching ceremony, Finance Minister Dinh Tien Dung expressed his hope that enterprises and stakeholders will find necessary and useful information on the VTIP to facilitate trading activities in the country. He said the VTIP would provide information related to existing trade regulations and procedures, legal documents on administrative formalities, guiding documents, forms, licenses and fees. The portal is also expected to help improve trade regulations as lawmakers may now easily identify the complexity of current regulations and procedures applicable to commodities and therefore may suggest areas to be simplified and modernized. Having a single portal containing all trade regulations and procedures will save time and costs for businesses, especially for small- and medium-sized enterprises interested or involved in goods import, export and transit, experts said at the event. Sebastian Eckardt said trade is an important drive force for Vietnam’s growth, adding that it is crucial for entrepreneurs and investors to get easy access to information on import and export procedures. Therefore, the portal will be a one-stop point of information where users can find relevant documents on export and import. When is the finalization report at enterprises examined?